The Ultimate DDR4 Memory Kit – for Today and the Future. 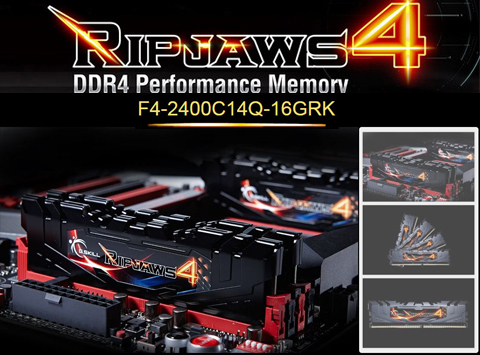 Whether you are a PC performance seeker or an overclocker, the G.SKILL Ripjaws 4 F4-2400C14Q-16GRK memory kit is a great choice. It is validated for compatibility with most X99 motherboards under a series of rigorous tests in quad-channel memory operations. It delivers a super-fast speed and low latency to address your daily needs in work and entertainment, while the support for Intel XMP 2.0 makes overclocking a breeze. Moreover, it works at an ultra-low voltage of 1.2V, and comes with a stylish heat spreader for impressive heat dissipation. Super-fast Transfer Speed Whether you are processing large amounts of data or playing data-intensive hot titles, the F4-2400C14Q-16GRK memory kit offers lag-free response. It is rated at 2400MHz to deliver up to 19.2GBps bandwidth per channel. You can enjoy a faster computing experience for gaming, video & image editing, rendering, or other professional applications. Extreme Performance Just set and go. Programmed with the latest Intel XMP 2.0 profiles, the only thing between you and extreme performance is a simple setting. Outstanding cooling design – without compromising style Confidently knowing your system is a combination of beauty and brawn, the Ripjaws 4’s new dashingly sleek heatspreader keeps your system cool and well cooled. Looks isn’t everything, but your rig should look great and perform great at the same time. The Ripjaws 4 has a module height of 40mm – the same height as previous Ripjaws family modules, and will be compatible with most CPU heatsinks. More power efficient. Less heat. Meticulously designed to operate at a low voltage of 1.2V, this memory kit consumes less power and generates less heat, enhancing system stability. Great compatibility The F4-2400C14Q-16GRK memory kit is specifically designed to complement quad-channel capable systems, and is compatible with most Intel X99 platforms. It’s guaranteed to provide the best-in-class performance, compatibility, and stability with the widest range of X99 motherboards.